a: Centre for Exploration Targeting, University of Western Australia M006, 35 Stirling Highway, Crawley, Western Australia 6009, Australia. b: King Abdulaziz City for Science and Technology (KACST), Riyadh, Saudi Arabia. Extracted and modified from: Alghamdi et al. (2018), and for full details see that publication. Large Igneous Provinces (LIPs) have wide-ranging and substantial impacts on the Earth, including changing atmospheric and ocean chemistry, affecting plate motions, and contributing to crust and mantle evolution (Ernst 2014). For Cenozoic and upper-Mesozoic LIPs, the near-surface portions (e.g. flood basalts and hypabyssal sill complexes) are often well preserved, and the deeper parts of the systems can often be mapped with geophysical methods, which commonly are able to sense physical properties associated with LIPs. In young LIPs, these properties are associated primarily with the thermal perturbations of the mantle, but also include active seismicity, dynamic topography and other ephemeral features. Older LIPs do not possess such readily resolvable geophysical signals, due to the decay of the thermal perturbation, and due to their upper-crustal portions being eroded, or buried beneath later sedimentary basins. This value is, however, offset by a lack of accessibility, with rare exposures, and geophysical imaging methods that are relatively difficult to apply across extensive areas. The ca. 1080 Ma Warakurna LIP (Fig 1) is one such Proterozoic LIP, extending across central and western Australia. Initially, this LIP was defined on the basis of outcropping mafic-ultramafic sill, dyke, and intrusion sequences, and a drillcore intersection (Wingate 2004). The main regions, however, are widely separated, with intervening regions covered by younger sedimentary basins of up to 10 km thickness. Key questions exist as to what extent these magmatic centres represent a spatially connected system versus individual events, and the nature of the larger-scale event that caused them. Figure 1: Tectonic map of the study region. 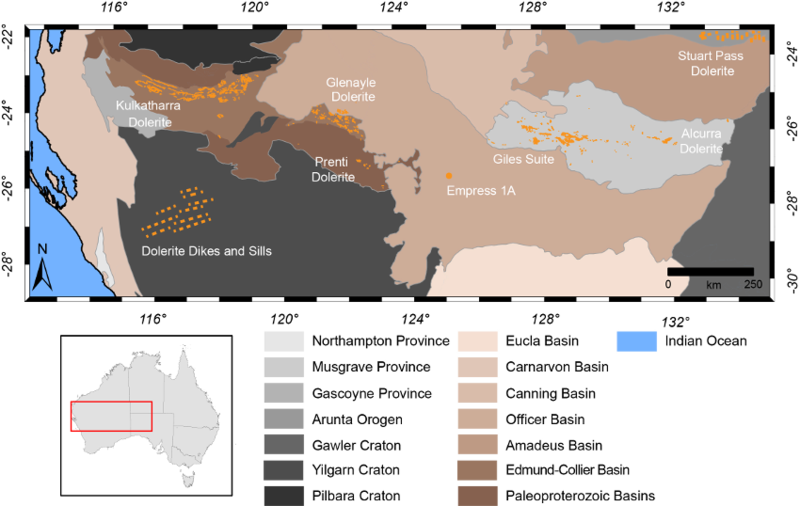 Orange features indicate the distribution of recognised igneous rocks associated with the Warakurna LIP at the surface (Wingate et al., 2004). This work sought to delineate the larger Warakurna LIP system. Previous investigations had identified interesting features in the lower crust that may suggest a substantial addition of magmatic material at the base of the crust (Aitken et al., 2013, 2015; Howard et al., 2013; Salmon et al., 2013), however this was not spatially well-defined within the continent-scale models that were available. The final model, selected from a 56 model ensemble on the basis of low bias and good data fit, shows as a key feature a broad expanse of thick crust (> 45 km thick) with bulk crustal density in excess of 2830 kg/m3 ( Figures 2 and 3). 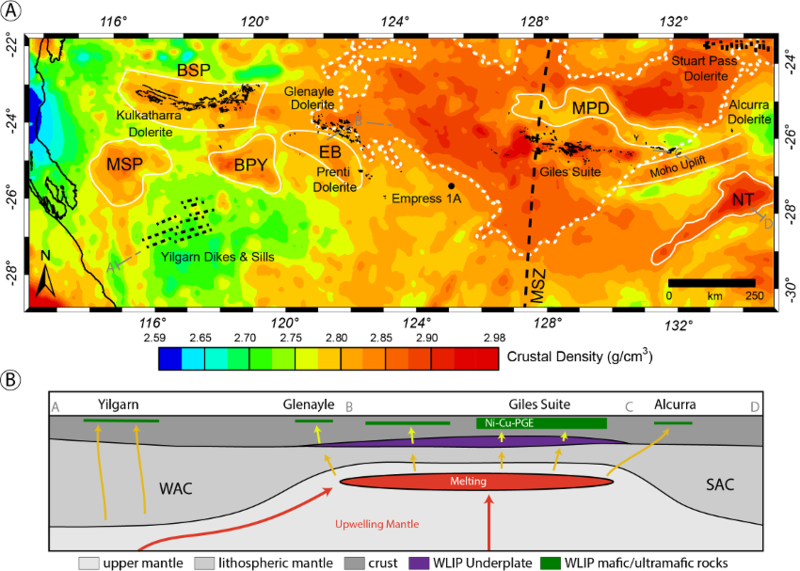 The thickest crust and highest densities are found in the west Musgrave Province, long considered the major magmatic centre of the Warakurna LIP. Our results suggest that, from the west Musgrave Province, the high crustal-density domain extends to the northwest, towards the Paterson Orogen, to the northeast, towards the Arunta Orogen, and to the north and south, following the trend of the Mundrabilla Shear Zone. Notably, the magmatic centres in the northwestern Yilgarn Craton and also in the eastern Musgrave Province possess low-density crust (ca. 2700 - 2750 kg/m3). This suggests substantially different processes in the lower crust of these regions compared to the high density domain. The Capricorn Orogen region possesses thickened and moderately high density crust that is broadly coincident with the Kulkatharra Dolerite (Fig 3). This may, conceivably, be linked to the Warakurna LIP but recent works suggest that the high density relates to a distinct and suture-bound tectonic block, and so may be substantially older (Alghamdi et al., 2018). We consider the resolved crustal mass excess to be representative of magma flux during the Warakurna LIP, with most of this focused within an extensive magmatic underplate. The geometry of the interpreted underplate occupies the roughly triangular space between the West Australian, South Australian and North Australian cratons, suggesting that the extent of this underplate is linked to lithospheric thickness at the time of emplacement. It is likely that, at 1.1 Ga, the lithosphere was very thin beneath regions affected by late Mesoproterozoic orogenesis, including events in the Musgrave Province and Warumpi Province (Morrissey et al., 2011; Smithies et al., 2011). In contrast, regions affected by mainly Archean to early Mesoproterozoic events almost certainly had significantly thicker lithosphere at 1.1 Ga. Upwelling mantle may have been directed into this region by the surrounding lithospheric keels, and also increased melting may have occurred in the relatively undepleted and hot Proterozoic mantle. With respect to Ni-Cu-PGE ore genesis it has been demonstrated in several examples that ore deposits are often emplaced following a "breakthrough" event that allows emplacement of sub-crustally ponded melt into the crust (e.g. the west Musgrave Province (Maier et al., 2015) and Jinchuan (Porter, 2016)). One possible mechanism involves the gradual to episodic ponding of sub-crustal melts at the base of the crust, building sufficient pressure to overcome buoyancy barriers. A "breakthrough" event may follow either when pressure becomes sufficient for autonomous breakthrough, or due to some tectonic trigger event. Based on gravity modelling, we define a large region beneath Central Australia characterised by thick and high density crust, interpreted to represent a magmatic underplate. This region appears to connect several magmatic centres of the Warakurna LIP and also is bounded by the margins of surrounding Archean to Paleoproterozoic cratons. To explain these characteristics we infer a region of high crustal magma flux during the Warakurna LIP, with magmatism focused into this zone by the lithospheric architecture at the time of the Warakurna LIP. We infer, for regions with high magma flux, increased potential for an ore-forming event relative to regions where magma flux is limited, and suggest that this may be associated with increased Ni-Cu-PGE prospectivity for the underplated region. Within the underplated region, several discrete areas possess especially high density, including the west Musgrave Province (where known deposits are concentrated) and the Salvation Basin, as well as several regions beneath the Officer, Amadeus and Canning Basins (Fig 8). Mapping the extent and mass-excess of lower crustal magmatic products provides an effective indicator of the extent and intensity of magmatism during LIP events, and in this case, helps provide a stronger understanding of Warakurna LIP processes, including ore-deposit formation. This work provides a large-scale setting within which to interpret existing magmatic centres but also defines some potential new centres that may provide new opportunities to understand the evolution of the Warakurna LIP and its exploration potential. Aitken, A.R.A., Altinay, C., Gross, L., 2015. Australia's lithospheric density field, and its isostatic equilibration. Geophysical Journal International in press. Aitken, A.R.A., Salmon, M.L., Kennett, B.L.N., 2013. Australia’s Moho: a test of the usefulness of gravity modelling for the determination of Moho depth. Tectonophysics 609, 468-479. Alghamdi, A.H., Aitken, A.R.A., Dentith, M.C., 2018. The composition and structure of the deep crust of the Capricorn Orogen. Australian Journal of Earth Sciences 65, 9-24. Alghamdi, A.H., Aitken, A.R.A., Dentith, M.C., 2018. The deep crustal structure of the Warakurna LIP, and insights on Proterozoic LIP processes and mineralisation. Gondwana Research. 56, 1-11. Ernst, R.E., 2014. Large Igneous Provinces. Cambridge University Press, 653 p.
Howard, H.M., Quentin de Gromard, R., Smithies, R.H., Kirkland, C.L., Wingate, M.T.D., Aitken, A.R.A., Korsch, R.J., Gessner, K., Blewett, R.S., Pawley, M.J., Gorczyk, W., Carr, L.K., Neumann, N.L., Holzschuh, J., Duan, J., Goodwin, J.A., Jones, T., 2013. Geological setting and interpretation of the northeastern half of deep seismic reflection line 11GA–YO1: west Musgrave Province and the Bentley Supergroup in Neumann, N.L. (editor), Geoscience Australia Record 2013/28 Chapetr 4 (pp. 51-95). Maier, W.D., Howard, H.M., Smithies, R.H., Yang, S.H., Barnes, S.J., O'Brien, H., Huhma, H., Gardoll, S., 2015. Magmatic ore deposits in mafic-ultramafic intrusions of the Giles Event, Western Australia. Ore Geol Rev 71, 405-436. Morrissey, L., Payne, J.L., Kelsey, D.E., Hand, M., 2011. Grenvillian-aged reworking in the North Australian Craton, central Australia: Constraints from geochronology and modelled phase equilibria. Precambrian Research 191, 141-165. Porter, T.M., 2016. Regional tectonics, geology, magma chamber processes and mineralisation of the Jinchuan nickel-copper-PGE deposit, Gansu Province, China: A review. Geoscience Frontiers 7, 431-451. Salmon, M., Kennett, B.L.N., Saygin, E., 2013. Australian seismological referencemodel (AuSREM): Crustal component. Geophysical Journal International 192, 190-206. Smithies, R.H., Howard, H.M., Evins, P.M., Kirkland, C.L., Kelsey, D.E., Hand, M., Wingate, M.T.D., Collins, A.S., Belousova, E., 2011. High-temperature granite magmatism, crust-mantle interaction and the mesoproterozoic intracontinental evolution of the Musgrave Province, Central Australia. Journal of Petrology 52, 931-958. Wingate, M.T., Pirajno, F., Morris, P.A., 2004. Warakurna large igneous province: a new Mesoproterozoic large igneous province in west-central Australia. Geology 32, 105-108.